FORMER ARSENAL STRIKER Ian Wright struggled to make a case for under-fire boss Arsene Wenger to continue at the Emirates Stadium next season and called on the Gunners to target a manager like Tottenham’s Mauricio Pochettino. Arsenal crashed to a 3-0 defeat to Manchester City in Sunday’s Carabao Cup final to increase the pressure on Wenger amid the club’s woes. The Londoners have endured another difficult season under Wenger, whose side are sixth and a staggering 27 points adrift of Premier League champions-elect City, while they avoided an embarrassing Europa League exit despite a shock 2-1 loss at home to Ostersund. Wenger, who signed a new two-year deal last May, has been in charge since 1996, but Wright believes time is fast running out for the long-serving 68-year-old Frenchman. “There are excuses [from Wenger] and he is mollycoddling a team,” Wright told BBC Radio 5 Live. ”Whether he stays at the end of this season, I could not make a case. Wright said: “I want Arsenal to challenge again, for them to sign players who will get you excited. I want someone in the boardroom who will lay it down. A few of the players are on easy street, own properties and are renting them out. Former Bayern Munich boss Carlo Ancelotti and Napoli’s Maurizio Sarri have been linked with the Arsenal job, while Monaco head coach Leonardo Jardim and Germany tactician Joachim Low are also candidates, but Wright suggested the team’s next manager should be in the category of Pochettino. “The club need to start looking for somebody who is not old,” he continued. “They are talking about Ancelotti, but they need to find the next one like Mauricio Pochettino, who built his way up. Email “'Arsenal need a manager like Pochettino' - Wright feels time is up for Wenger”. 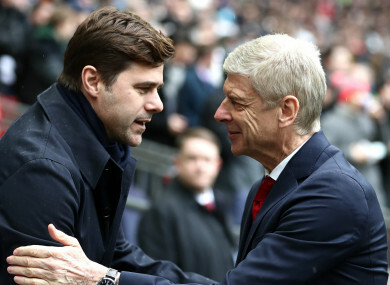 Feedback on “'Arsenal need a manager like Pochettino' - Wright feels time is up for Wenger”.